Think it's impossible to find a fast, easy, healthy breakfast for kids? Are you tempted to give your kids sugar-bomb breakfast cereals because it is fast and easy in the mornings? I'll tell you what happened here last week to show you how simple healthier options can be. Have you ever fed 5 kids a healthy breakfast in 5 minutes? Our son had two friends sleep over one night last week, so I fed five kids breakfast in the morning. As I put it in front of them, I was feeling so good about what they ate, I thought I'd share how easy it was. Using only a toaster and my hot water tap, it all took about 5 minutes to pull together. Two had blueberry pancakes that I had in the freezer, with organic pastured butter and real maple syrup. They were made with local blueberries and my healthy organic pancakes/waffle recipe. I just popped them in the toaster. Two had a piece of fermented organic whole wheat bread, toasted with organic pastured butter and organic jam. One had waffles that I'd also had in the freezer, made from the same recipe as above, toasted, also with organic pastured butter and real maple syrup. A couple also had some frozen local blueberries in a cup, which I ran under my hot water tap to thaw, and then drained. My daughter asked for some frozen peas to eat alongside her pancake, (I was shocked, but loved it), which I ran under hot water to thaw. One of the other kids saw that and asked for them, too! I was telling my friend, Sonia about all this (her son was one of our guests) and she said, “You know, people say you can't get kids to eat healthy, but here you had kids from three different families, happily eating all that healthy food!” I said, “Yep, and I think it's because I only had healthy options here.” I know what you're thinking… but they all had seconds, so it wasn't that they didn't like it and only forced it down to be polite or because it was all we had! Now if I had offered them Fruit Loops or Pop Tarts, I wonder what they would've chosen? Believe me, my kids still eat stuff they shouldn't and get plenty of treats. I just made cookies yesterday when a bunch of neighbor kids were here. But they're homemade, I cut down the sugar in the recipes, and use only healthy, and mostly organic, ingredients. (And still the kids often tell me that I make the best cookies!) Most importantly, I only use healthy fats when I cook and bake. All this is much better than whatever you could buy at the store. Also, I always make and freeze extras (or freeze extra dough), then we have more for a treat later – this is a big time-saver. Moms, it's up to you. Just don't buy the crap, and if it's not in the house, they can't eat it. 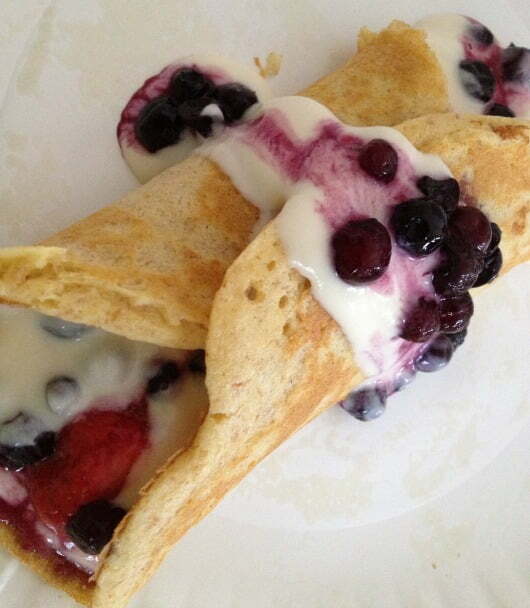 Find the recipe pictured above: Breakfast crepes! Need more help getting your family onto real food? Click here to get my book, Real Food for Rookies! Do you know why low fat dairy is NOT good for your kids, no matter their age? More healthy breakfast options, or see my entire list of healthy breakfast ideas here. Sometimes I’ll put together something the night before that only needs to be taken out of fridge and put in oven next morning. Usually wheat muffins, biscuits, egg casserole. No, the brown rice is uncooked…same for oatmeal. I just measure the rice, rinse, and dump into blender. The rice will be pulverized by the blending, and then the soaking further softens it, I guess. You’ll have to post to let us know what you think of these! Christi (& Barb from the comments at the other post), this has to be COOKED brown rice, right? Wow, you’re the 2nd person in a week to mention this recipe! I’m printing it out right now! Thanks for the inspiration! I’ve done pretty good with healthy breakfast options for the kiddos this summer, but in a weak moment (because I had all 4 grocery shopping with me and we were all hungry!) recently at Wal-Mart I succumbed to “kid-pressure” and bought several bags of the sugary cereal. Ughhh…so disgusting! Anyway, I’m back on the breakfast- wagon, and am doing my best! These are not made with flour, but instead brown rice and oatmeal…and she uses the two-stage process (soaking) method. My kids love these! Wow, I never thought of freezing homemade pancakes! I’ve come to associate frozen breakfasts with such an unhealthy lifestyle that it just didn’t occur to me. Thanks for the tip! I’m going to try that. This is so very true! If you make yourself NOT buy the stuff you want to ease off of, then you automatically will come up with an alternative. For awhile, in the beginning, I had to go grocery shopping by myself. It was the only way!